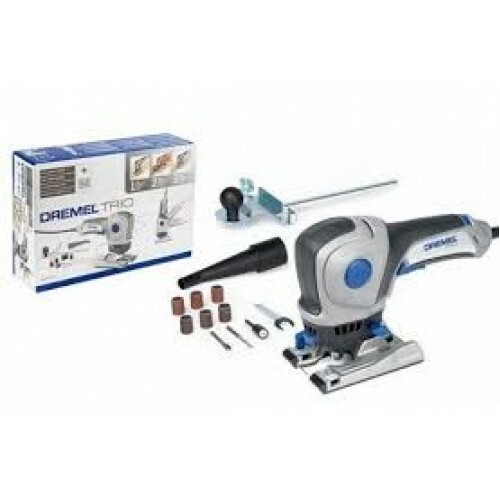 The new Dremel TRIO is the ultimate tool for everyone involved in general handson projects in and around the house. The Dremel TRIO has a 3 in 1 Spiral System which enables you to cut, sand and rout with 1 and the same tool. This versatile, compact and lightweight tool is very powerful! The Dremel TRIO has superior ergonomics, a 2 position handle and variable speed which ensures the most optimal rate of working in different materials. With its 360° spiral cutting technology and plunge-cut ability, the tool makes quick and freehand cuts in wood, plastic, drywall, metal, and wall tile. Next to that there are also dedicated TRIO sanding and routing accessories and attachments, so this tool will complete your project from start to finish! one tool, multiple applications. Soft start: smooth start without jerk effect. Pivoting handle: easier work orientation (horizontal & vertical). Pistol grip: comfortable handling. Adjustable working depth: for working in various material thickness. Non marring foot: won't scratch delicate surfaces. Second Hand Grip zone: for maximum control. Vacuum Attachment: for cleaner working environment.